A nun is a celibate Catholic woman who lives her life, under formal vows, in service to God. Nuns usually work and live inside a convent and are part of a religious order. Like monks and religious priests, a nun will often wear a habit, a specially prescribed garment specific to their order. It is usually black and white, sometimes brown or blue (depending upon the particular religious order), and signifies one's service to God. Each order has its special mission. Some nuns work as teachers in Catholic schools or as nurses in hospitals. All nuns must take a vow of poverty, and any money they earn goes towards supporting their convent or order. In addition to women who have never married, widows and those who are not virgins may become nuns, but divorcees may not unless approved by the Holy See. In Catholicism, ordination of women as priests is not possible, but becoming a nun is considered a holy vocation. 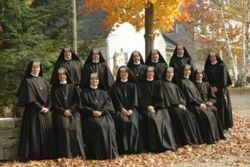 Women who believe they have the vocation to religious life are encouraged to try living in a convent for a time so they might decide whether this is indeed their vocation from God. A beginner nun is called a novice and is required to take vows of chastity and poverty. Leaving the sisterhood after taking vows is frowned upon, but has become common in the United States since the reforms of the Second Vatican Council. The Episcopal and Anglican Churches also have women religious who are known as "nuns". They take vows of poverty and chastity as their Catholic counterparts do. Buddhist nuns are required to shave their heads. Should I Become a Nun? Take the test! This page was last modified on 13 July 2016, at 11:50.